Big Data . Will it supercharge the economy, and revolutionize how companies compete? Will it tyrannize us all, as governments and businesses track and anticipate our every move? Or is it all just hype? 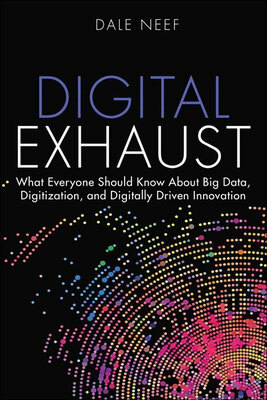 In Digital Exhaust, leading digital expert Dale Neef cuts through the breathless enthusiasm and dystopic sci-fi visions, placing Big Data in a realistic context that reflects the larger technological and economic processes that are changing our world. Neef explains how Big Data works, what can be done with it, and what it all really means. Neef shows how an emerging Big Data-intelligence complex is innovating at a pace that is increasingly difficult to absorb or regulate. Then he assesses the implications: not just for civil liberties and personal privacy, but for businesses, the economy, law, and even geopolitics. Digital Exhaust offers realistic insights for anyone involved in the business, technical, or policy aspects of Big Data projects, and for anyone affected by Big Data…in other words, just about everyone. Inside the world’s biggest databases: who’s tracking you now? Digital Exhaust is today’s definitive Big Data primer on the implications of Big Data, digitally driven innovation, and the accelerating Internet Economy.